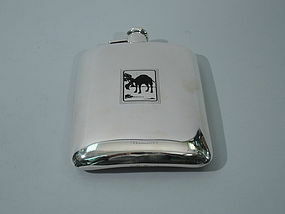 Nelson & Nelson Antiques has an array of delightful sterling silver flasks for sale. Each of these antique silver flasks are made with exquisite craftsmanship and gorgeous designs to captivate the eyes of its beholder. These antique silver flasks have unique histories, some of which date back to the 19th century. Nelson & Nelson Antiques carry genuine Tiffany & Co. pieces as well as other pieces from reputable silversmiths. These flasks are perfect on display as statement pieces or as serviceable drinking vessels. 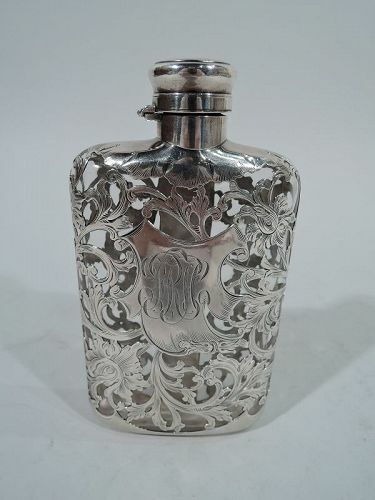 Search through our collection of antique sterling silver flasks for sale and find luxury gifts for a special groom, best man, groomsman, party host, or spouse. These flasks are also a stately piece to use at a professional sporting event or at a particularly extravagant party. 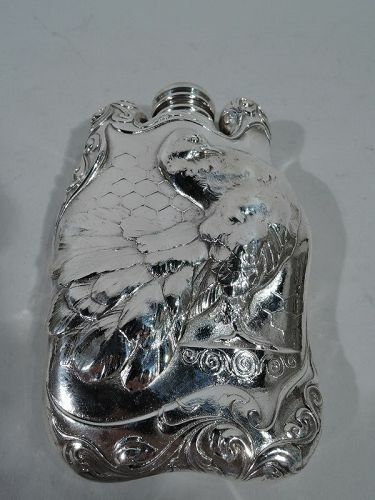 Regardless of the style or era youre searching for, youre sure to find something exquisite from our collection of antique sterling silver flasks. 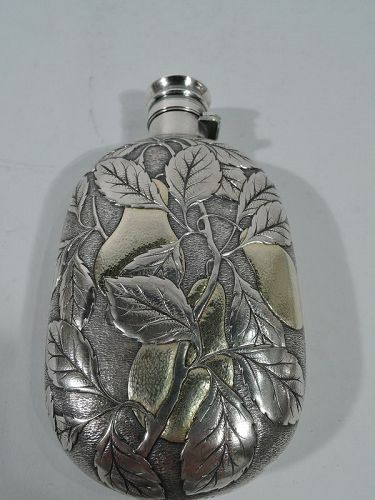 American Art Nouveau sterling silver flask. Undulating shape with high shoulders and hinged and cork-lined cover. On front is a game fowl (possibly turkey). A big bird, with rich tail plumes spilling over the side. In background is openwork pattern, suggestive of the coop’s wire mesh. Fluid turn-of-the-century scrollwork on shoulders and bottom. On back is engraved prize presentation dated 1896. Hallmarked “Sterling 5345”. Very good condition. Japonesque parcel-gilt sterling silver flask. Made by Gorham in Providence in 1884. Curved body with short neck and hinged and cork-lined cover. On front is chased pear branch with gilt fruit on stippled ground. On back is engraved armorial with olden-days script presentation. Hallmark includes date letter and no. 76. Very good condition. 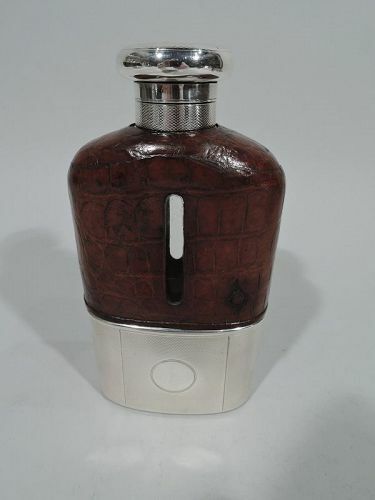 Large sterling silver flask with enameled flask. Made by R. Blackinton in Attleboro, Mass., ca. 1920. On front in black enamel is drooping camel, with sagging tail and panting tongue. On back, the beast is revived! He stands tall with head thrust back. With hinged, threaded, and cork-lined cover. A great Prohibition-era novelty. Hallmark includes no. 9715. Excellent condition.